CollegeHumor.com continues their reign as one of the best spots on the internet for subversive humor with their sketch “My So-Called Homeland”, which mashes together two Claire Danes TV shows. Basically, it’s what happens if one-season wonder My So-Called Life was about the trials and tribulations of puberty, boys and suicide bombers. If you thought that the only thing that My So-Called Life and Showtime’s Homeland had in common was Danes…well, you were right, but not any longer! Don’t think mid-90’s teen angst and homeland security go together? You’re very wrong. 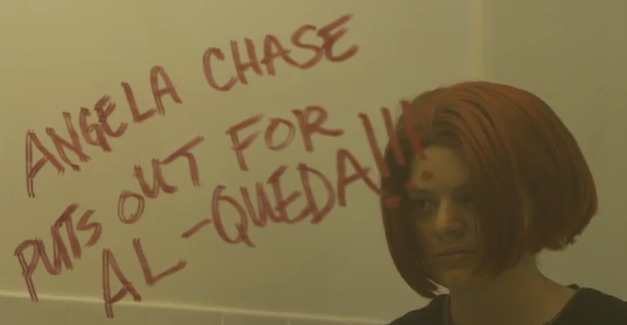 In the clip, Angela Chase sports her familiar bright red ‘do while working counter-terrorism for the CIA and crushing on a possible undercover terrorist (as they make out he whispers, “I just want to serve my country…and get to second base with you…and kill the vice president”). While she may be a CIA agent rather than a high school sophomore, Angela Chase still raises whiny introspection to an art form: her creative intelligence report reads, “The lunchroom drones, one by one. We eat the pizza but they feed us lies.” And CIA agents prove that they can be as catty as any teenage girl, scrawling “Angela Chase puts out for Al-Queda” on the bathroom mirror in lipstick. Watch the sketch, but make sure you have a Cranberries album on standby. You’re gonna need it.